This is the picture I mentioned in a comment on picture #3727. 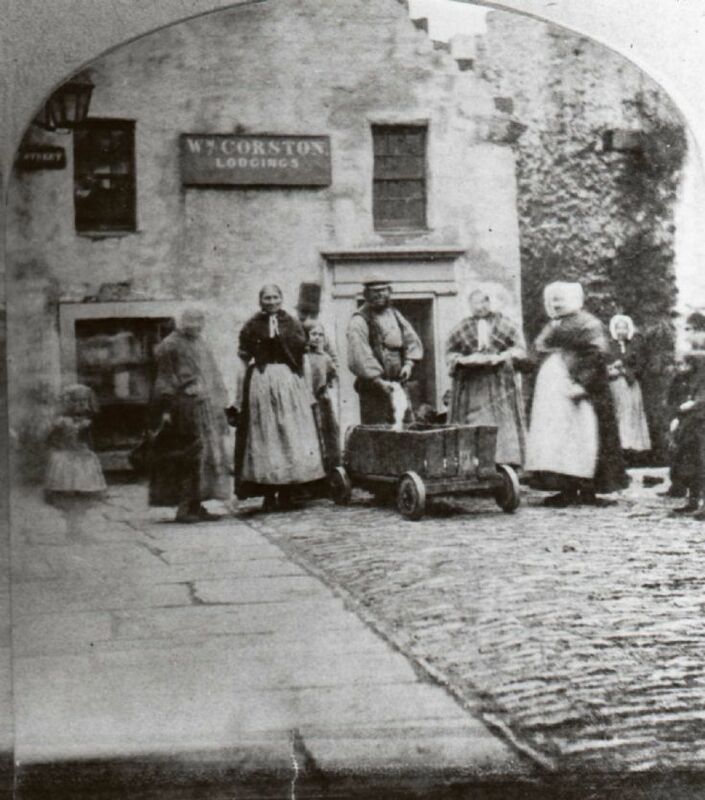 I had seen it captioned as the old poorhouse (ie where the Dunfermline is now) but could not understand that because of the presence of the street sign and the alignment of the cobbles. On checking last week at the Orkney Library photo archive, from where I obtained this copy, I found as I suspected that it is actually at the Bridge. The building straight ahead is where Stevenson's newsagents are now. Just visible on the right is part of the Parliament Close. This formed three sides of a square and was cleared away when the Commercial Bank was built in the 1860s. The ground floors of the buildings look lower than the street. The latter was probably raised when the burn was culverted and the bridge paved over. I'm told when the street was dug up not long ago you could see steps leading down to the burn for the washing and dyeing of clothes. Did anyone take a photo? Date estimated. This is one half of a stereo view in the Orkney Library and Archive. It was advertised as one of a group of 'Orcadian Views' in the Illustrated London News in August 1861 and taken by Charles Hubbard, a bird stuffer and photographer from Norfolk.